LEWISTON - Wanda C. Lincoln, 93, of Lewiston passed away peacefully at Montello Commons on Sunday, Feb. 10, 2019, following a brief illness. 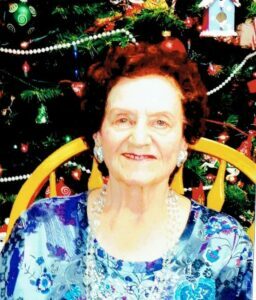 LEWISTON – Wanda C. Lincoln, 93, of Lewiston passed away peacefully at Montello Commons on Sunday, Feb. 10, 2019, following a brief illness. She was born in Portland, Maine, on April 5, 1925, the oldest daughter of Henry and Julia (Gadris) Rombalski. Wanda graduated from South Portland High School in 1943. She worked for Mutual of Omaha until she married Raymond L. Lincoln on April 16, 1949. They lived in Poland Spring, Maine, most of their lives raising their nine children. Wanda was a full-time, stay-at-home mom. Wanda enjoyed canning, cooking, reading, listening to music, especially Rod Stewart, and going to her favorite Chinese restaurants. Wanda was happiest when she was with her family. Wanda is survived by her eight children: Linda and Wayne Davis of Lewiston, Nancy and John Marcigliano of Westbrook, Janice and Bill Baker of Lewiston, Spencer and Marilyn of Mississippi, Wayne and Thy of Okinawa, Thomas and Virginia of Hampden, Cindy Lincoln and Sarah of Texas, and Cathy Dickson of Texas. She also leaves behind her 24 grandchildren, a very special granddaughter, Tina Davis Camp “Grammie’s Little Angel”, 24 great-grandchildren; and one great-great-grandson, Louis Berube. She was predeceased by her husband, Raymond Lincoln Sr.; as well as her son, Raymond Lincoln Jr.; her brothers, Richard and Eddie; and her sister, Anna. The family wishes to thank the incredible staff at Montello Commons and Androscoggin Homecare and Hospice for the care, compassion and devotion they showed Wanda during her time with them. Condolences may be shared with her family at www.thefortingrouplewiston.com. A graveside service will be held in the spring at a later date at Pine Grove Cemetery in Poland followed by a celebration of her life. Arrangements are under the care of The Fortin Group Funeral Home, Cremation and Monument Services, 70 Horton St., Lewiston.